Vorinostat (suberoylanilide hydroxamic acid, SAHA) is an HDAC inhibitor with IC50 of ~10 nM in a cell-free assay. Activity of vorinostat in Jurkat and Peer T-ALL cell lines in an MTT cell viability assay. Cells were treated with increasing drug concentrations for 72 h. The data are plotted as the mean % of DMSO-treated control cells against the corresponding drug concentration. The error bars are the standard error. For each drug and cell line, 3-4 independent experiments were performed with 6 replicates at each drug concentration. Entinostat (MS-275) strongly inhibits HDAC1 and HDAC3 with IC50 of 0.51 μM and 1.7 μM in cell-free assays, compared with HDACs 4, 6, 8, and 10. Phase 3. (A) U87 cells were cultured in the presence of DMSO, 1 uM MS-275 alone, 100 ng/ml IFN-λ1 alone, or both for the course of 4 d. Cell numbers were manually determined by hemacytometer counting at the indicated time points. (B, F) Cell proliferation of U87 cells or U87 spheroids in 3D culture with indicated treatment were performed using the WST-1 assay, which measures active cellular metabolism. (C) U87 spheroid formation in 3D culture was photographed at day 14 in culture (representative images are shown; 200x magnification). (D-E) Quantification of the relative sizes and numbers of U87 spheroids in (C). (G) Cell cycle analysis was performed in U87 cells with indicated treatment using propidium iodide staining. Numbers in the histogram show fractions (percent) of sub-G1, N, 2N, and polyploidy from left to right. (H) U87 cells with indicated treatment were stained with Annexin V-FITC and 7-AAD. Numbers indicate the percentage of FITC-positive cells (upper left quadrant). FITC, fluorescein isothiocyanate; 7-AAD, 7-Aminoactinomycin. In all panels, data represent the mean and SEM of at least three experiments. Panobinostat (LBH589) is a novel broad-spectrum HDAC inhibitor with IC50 of 5 nM in a cell-free assay. Phase 3. (G) A375 parental and BRAFi-resistant ex vivo clones were treated with a panel of HDACi (1 μM vorinostat, 0.5 μM belinostat, and 6 nM panobinostat) in single treatment or in combination with 1 μM vemurafenib in a long-term colony formation assay. Trichostatin A (TSA) is an HDAC inhibitor with IC50 of ~1.8 nM in cell-free assays. Gck expression in WT primary hepatocytes transduced with FOXO1 and KR-FOXO1 adenoviruses in the presence or absence of trichostatinA (TSA). Mocetinostat (MGCD0103) is a potent HDAC inhibitor with most potency for HDAC1 with IC50 of 0.15 μM in a cell-free assay, 2- to 10- fold selectivity against HDAC2, 3, and 11, and no activity to HDAC4, 5, 6, 7, and 8. Phase 2. Comparison of MCAS ovarian cancer cells harboring control and CtBP2 knockdown shRNAs for sensitivity to chemotherapeutic agents. For each cell line, the MTT reading of the untreated cells was assigned as 100%. HDAC inhibitors: (a) Trichostatin A; (b) Vorinostat; (c) Belinostat; (d) MGCD0103; (e) valproic acid; and (f ) carboplatin, a non-HDAC inhibitor. TH34 is a HDAC inhibitor that shows pronounced selectivity for HDACs 6, 8 and 10 over HDACs 1, 2 and 3. In a NanoBRET assay, TH34 strongly binds HDAC6, 8 and 10 with low-micromolar IC50 concentrations (HDAC6: 4.6 µM, HDAC8: 1.9 µM, HDAC10: 7.7 µM). UF010 is a class I HDAC-selective inhibitor with IC50 values of 0.5 nM, 0.1 nM, 0.06 nM, 1.5 nM, 9.1 nM and 15.3 nM for HDAC1, HDAC2, HDAC3, HDAC8, HDAC6 and HDAC10, respectively. Suberohydroxamic acid is a competitive HDAC inhibitor with IC50 values of 0.25 and 0.3 μM for HDAC1 and HDAC3 respectively. Raddeanin A, a triterpenoid saponin from Anemone raddeana Regel, displays moderate inhibitory activity against histone deacetylases (HDACs) and has high antiangiogenic potency, antitumor activity. Biphenyl-4-sulfonyl chloride is a HDAC inhibitor with synthetic applications in palladium-catalyzed desulfitative C-arylation. Belinostat (PXD101) is a novel HDAC inhibitor with IC50 of 27 nM in a cell-free assay, with activity demonstrated in cisplatin-resistant tumors. A375DR and parental cells were seeded 50,000 cells per well in 6-well plates and treated with 1 mMvorinostat (Vor), 0.5 mMbelinostat (Bel), 5 nMpanobinostat (Pan), and/or combination of 5 nM trametinib and 0.125 mM dabrafenib. Romidepsin (FK228, depsipeptide) is a potent HDAC1 and HDAC2 inhibitor with IC50 of 36 nM and 47 nM in cell-free assays, respectively. Concentration over time for each dose cohort of romidepsin (B). MC1568 is a selective HDAC inhibitor for maize HD1-A with IC50 of 100 nM in a cell-free assay. It is 34-fold more selective for HD1-A than HD1-B. HDAC4 and OA1 expression correlate inversely during starvation, and HDAC4 inhibition or knockdown leads to OA1 transgene up-regulation. Quantification of OA1 mRNA expression by real-time PCR in HeLa-OA1myc cells at the indicated times of incubation with MC1568 (class II HDACi). Data are expressed as the fold change compared with the amount of the OA1 mRNA in mock conditions at each time point. Tubastatin A HCl is a potent and selective HDAC6 inhibitor with IC50 of 15 nM in a cell-free assay. It is selective (1000-fold more) against all other isozymes except HDAC8 (57-fold more). Control and MEC17 KD macrophages (RAW264.7) were treated with TBSA or DMSO for 12 hours followed by LPS treatment for indicated time. p38 phosphorylation were determined by immuno-blotting. Givinostat (ITF2357) is a potent HDAC inhibitor for maize HD2, HD1B and HD1A with IC50 of 10 nM, 7.5 nM and 16 nM in cell-free assays. Phase 2. (e–h) Cytokine secretion. Pancreatic islets were isolated from 12-week (wk)-old non-diabetic, untreated diabetic or givinostat (Givi)-treated diabetic NOD-huCD3ε mice (after 3–4 weeks of treatment) (n = 5–9 per group). Islets were cultured at 37°C for 48 h and supernatant fractions were collected. Concentrations of (e) IL-1β, (f) IL-6, (g) TNF-α and (h) IL-10 were determined by ELISA; *p < 0.05. Dacinostat (LAQ824) is a novel HDAC inhibitor with IC50 of 32 nM and is known to activate the p21 promoter. Class I selective HDACi have the highest INS-1 rescue potential . INS-1 cells were monitored using the real-time xCELLigence system h and the impedance (cell adhesion) was measured as a surrogate of cell viability (cell index) as described in the Methods. (a ) The impedance of duplicates of control (green line), cytokine-exposed (red line) and cytokine+ITF-J-exposed INS-1 cells (blue line) was followed from the start of exposure (indicated by the arrow). Heat maps of 13 different ITF HDAC inhibitor compounds ( b )orsix different commercial HDAC inhibitor compounds (c) were made based on their IC50 values towards selected HDACs . 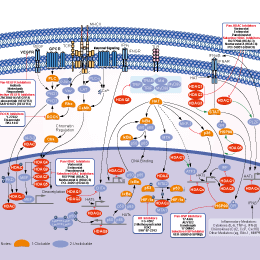 The HDACi inhibitors are ranked after rescue potential according to ESM Tables 1, 2 . ( c) Values are corrected for differences in potency since they varied from 33.3 (CI-994) to 0.041 (LAQ824). (d ) Colour code for both heat maps: low IC50 values coloured red, intermediate IC50 values coloured black and high IC50 values coloured blue; grey indicates undetermined IC50. CUDC-101 is a potent multi-targeted inhibitor against HDAC, EGFR and HER2 with IC50 of 4.4 nM, 2.4 nM, and 15.7 nM, and inhibits class I/II HDACs, but not class III, Sir-type HDACs. Phase 1. (a) Decay-corrected microPET/CT scan of MDA-MB-231 tumor bearing mice (n = 4) at 2, 4, and 24 h after i.v. injection of [64Cu]7. The image obtained with coinjection of CUDC-101 (20 mg/kg body weight) is shown for a 24 h blockade. Tumors are indicated by arrows. (b) Decay-corrected region-of interest (ROI) analysis on microPET images of the tumor uptake of [64Cu]7 with or without coinjection of CUDC-101 (20 mg/kg body weight). *, P < 0.05; **, P < 0.01. Quisinostat (JNJ-26481585) 2HCl is a novel second-generation HDAC inhibitor with highest potency for HDAC1 with IC50 of 0.11 nM in a cell-free assay, modest potent to HDACs 2, 4, 10, and 11; greater than 30-fold selectivity against HDACs 3, 5, 8, and 9 and lowest potency to HDACs 6 and 7. Phase 2. In vitro drug sensitivity of (C) quisinostat. Acute lymphoblastic leukemia cell lines (NALM-6, KOPN-30bi) and primary cultured cells established from patient 21 were cultured with the indicated concentrations of anticancer drugs, and viability was measured at 48 hours. Data are presented as percentages of dimethylsulfoxide (DMSO) control and depict the mean 6 standard deviation. Pracinostat (SB939) is a potent pan-HDAC inhibitor with IC50 of 40-140 nM with exception for HDAC6. It has no activity against the class III isoenzyme SIRT I. Phase 2. A significant decrease in detectable PLA signal following HDAC inhibition in SYO-1 cells A, B. is also confirmed by immunoprecipitation C. The decrease in PLA co-localization signal correlates with apoptosis induction by HDAC inhibitor FK228 in SYO-1 cells. PCI-34051 is a potent and specific HDAC8 inhibitor with IC50 of 10 nM in a cell-free assay. It has greater than 200-fold selectivity over HDAC1 and 6, more than 1000-fold selectivity over HDAC2, 3, and 10. (d) Effects of HDAC8 activity on ISO-induced augmentation of apoptosis and TIPRL expression. H1299 cells were sequentially treated with 10 μm PCI-34051 for 24 h, ISO for 30 min and 50 μM cisplatin for 48 h before the western blot analysis. Droxinostat is a selective inhibitor of HDAC, mostly for HDACs 6 and 8 with IC50 of 2.47 μM and 1.46 μM, greater than 8-fold selective against HDAC3 and no inhibition to HDAC1, 2, 4, 5, 7, 9, and 10. Chemical inhibition of HDAC3, -6, and -8 with the selective HDAC inhibitor Droxinostat (2 uM) resulted in a significant increase in the percent of 2D10 cells expressing GFP in cells that had been depleted of HDAC3 but not HDAC1 or -2. (*p<0.05). Abexinostat (PCI-24781) is a novel pan-HDAC inhibitor mostly targeting HDAC1 with Ki of 7 nM, modest potent to HDACs 2, 3, 6, and 10 and greater than 40-fold selectivity against HDAC8. Phase 1/2. Differential effects of HDAC inhibitors on histone and tubulin acetylation. Immunofluorescence analysis of histone H3 (K9ac/K14ac) and tubulin acetylation in HeLa cells treated for 4 h with vehicle, SAHA (10 μM), tacedinaline (50 μM), PCI-24781 (20 μM. (a) Mapping of histone acetylation in K562 cells treated with HDAC inhibitors by LC-MS/MS. Cells were treated with TSA (10 μM), SAHA (5 μM), PCI-24781 (2 μM), tacedinaline (50 μM) for 6 h. Histones were extracted from cells and acetylated peptides were quantified after isobaric tagging. RGFP966 is an HDAC3 inhibitor with IC50 of 0.08 μM in cell-free assay, exhibits > 200-fold selectivity over other HDAC. THP-1 cells were treated with indicated concentrations of Ara-C and/or RGFP966 for 24 h, and lysates were immunoblotted for p-AKT473, AKT and γH2AX. AR-42 is an HDAC inhibitor with IC50 of 30 nM. Phase 1. One- to 2-month-old mice of both genotypes showed an increase in H3K4me3 (n = 5 to 6 per group) associated with a dose-dependent increase in neurogenesis in Kmt2d+/βGeo mice (monitored by normalized DCX expression) (n = 4 to 6 per group) upon treatment with the HDACi AR-42. There was no difference in either H3K4me3 or neurogenesis between Kmt2d+/βGeo and Kmt2d+/+ animals at a dose of 10 mg/kg per day. Ricolinostat (ACY-1215) is a selective HDAC6 inhibitor with IC50 of 5 nM in a cell-free assay. It is >10-fold more selective for HDAC6 than HDAC1/2/3 (class I HDACs) with slight activity against HDAC8, minimal activity against HDAC4/5/7/9/11, Sirtuin1, and Sirtuin2. Phase 2. (a) Representative images from hTERT RPE-1 cells transiently transfected with siControl (siC), treated with vehicle (DMSO), alisertib (MLN8237) or rocilinostat (ACY1215) at the time of serum withdrawal for 48 h. Ciliation monitored by immunofluorescent staining using acetylated α-tubulin (cilia marker) and pericentrin (basal body marker). Nuclei counterstained using DAPI. Highlighted boxes show magnified cilia. Scale bar, 3 μM. Valproic acid sodium salt (Sodium valproate) is a HDAC inhibitor by selectively inducing proteasomal degradation of HDAC2, used in the treatment of epilepsy, bipolar disorder and prevention of migraine headaches. (A,B) Wild-type C57BL/6 male mice were treated with vehicle (saline) or 10 mg/kg of paraquat (PQ) for 3 days, and mice received VPA (3.5 mg/kg) or anacardic acid (5 mg/kg) starting 24 and 1 h before PQ injection. IL-6 mRNA expression was determined by real-time PCR. Tacedinaline (CI994) is a selective class I HDAC inhibitor with IC50 of 0.9, 0.9, 1.2, and >20 μM for human HDAC 1, 2, 3, and 8, respectively. Phase 3. A, 5×106 HeLa, A549, 293T, and H1299 cells were seeded in 10-cm cell culture dishes on day 0 and treated with dimethyl sulfoxide, 10 μM CI994, or 1 μM RGFP966 for 12 h. Cell lysates were collected for Western blotting analysis of Apaf-1 and -actin. CUDC-907 is a dual PI3K and HDAC inhibitor for PI3Kα and HDAC1/2/3/10 with IC50 of 19 nM and 1.7 nM/5 nM/1.8 nM/2.8 nM, respectively. Phase 1. Representative Oil Red O staining of lipid-filled mature adipocytes on day 7 for uninduced cells (a), adipocyteinduced hMSCs exposed to the vehicle control (b) or CUDC-907-treated cells (500 nM) (c). Nile red staining (d and e) on day 7 of post-adipocytic induction in hMSCs and after exposure to CUDC-907. Images were captured at ×20 magnification using the FLoid Cell Imaging Station. The level of Nile red staining was quantified using the Molecular Devices M5 Microplate Reader (f). Data are presented as mean ± S.E (n = 16) from three independent experiments, ***P <0.0005. Sodium butyrate, sodium salt of butyric acid, is a histone deacetylase inhibitor and competitively binds to the zinc sites of class I and II histone deacetylases (HDACs). U87 cells were cultured with DMSO or 10 µM 5azadC for 72 h. For the latter, 1 µM Trichostatin A (TSA), 10 mM sodium butyrate (NaBu), 5 mM nicotinamide (NAM), or 0.5 µM apicidin were added in the last 24 h. IFNLR1 expression was determined by RT-qPCR. Curcumin is the principal curcuminoid of the popular Indian spice turmeric, which is a member of the ginger family (Zingiberaceae). It is an inhibitor of p300 histone acetylatransferase（IC50~25 μM） and Histone deacetylase; activates Nrf2 pathway and supresses the activation of transcription factor NF-κB. Effect of NC1, NC1-CUR, NC2 and NC2-CUR on SH-SY5Y cell viability. The cells were treated for 24 h with different dilutions(1:1, 1:2 and 1:4) of empty nanocapsules (NC1 and NC2) and nanocapsules containing curcumin (NC1-CUR and NC2-CUR) followed by measurement of cell viability by MTT reduction assay (panel A) and cell toxicity by LDH release assay (panel B). Data after normalization to vehicle-treated cells (100%, MTT assay) or to total LDH release (TritonX100-treated cells, 100%) are presented as a mean±SEM from 3-8 independent experiments with five replicates. *p < 0.05, **p < 0.01 and ***p<0.001 versus vehicle-treated cells; &&&p<0.001 NC1 versus NC1-CUR. M344 is a potent HDAC inhibitor with IC50 of 100 nM and able to induce cell differentiation. HCT116 p53 null cells were treated with different HDACIs (1 μM TSA, 5 μM M344, 1 μM MS-275, 5 mM But, 10 mM VPA) for 24 h. ATF4, ATF3, CHOP and DR5 proteins were measured by Western blot. Tubacin is a highly potent and selective, reversible, cell-permeable HDAC6 inhibitor with an IC50 of 4 nM in a cell-free assay, approximately 350-fold selectivity over HDAC1. Verification of Hdac6 deletion in knockout MEFs. Expression of HDAC6 and acetylation of tubulin were analyzed by immunoblotting. RG2833 (RGFP109) is a brain-penetrant HDAC inhibitor with IC50 of 60 nM and 50 nM for HDAC1 and HDAC3 in cell-free assays, respectively. The cells were treated with 1 μM RG2833 (HDAC1/3 inhibitor), 2 μM RGFP966 (HDAC3 inhibitor), 1 μM TSA (pan-HDAC inhibitor), or vehicle for 16 h in serum-free medium. Cell lysates were analysed by Western blotting for expression of SREBP-2 activated fragment, HMG-CoA reductase and APP. Shown are representative blots and quantifications with means ± SEM of the indicated number of independent experiments performed in duplicate. *p < 0.05; **p < 0.01; n.s., not significant in one-sample t-test. Resminostat dose-dependently and selectively inhibits HDAC1/3/6 with IC50 of 42.5 nM/50.1 nM/71.8 nM, less potent to HDAC8 with IC50 of 877 nM. Assessment of apoptosis by flow cytometry. (A) SCC25 cells were treated with 2.5 μM and 5 μM resminostat. *Significant induction of cell death. Divalproex Sodium, consisting of a compound of sodium valproate and valproic acid in a 1:1 molar relationship in an enteric coated form, is a HDAC inhibitor, used in the treatment for epilepsy. Scriptaid is an inhibitor of HDAC. It shows a greater effect on acetylated H4 than H3. The relative expression of Oct4, Nanog, Klf4 and Sox2 at the blastocyst stage in ICSI-, ROSI- and ROSI + incubation of zygotes with 250 nM Scriptaid for 10 h (ROSI-S)-derived embryos. Five blastocysts in each pool were examined to obtain the data set in each column. Q-PCR analysis was performed in triplicate. Different letters indicate significant differences between values (P < 0.05). Sodium phenylbutyrate is a histone deacetylase inhibitor, used to treat urea cycle disorders. Representative images and quantitative analysis results of the transwell experiment. Notes: (A) Results of migration assay for DU145. (B) Results of invasion assay for DU145. (C) Results of migration assay for PC3. (D) Results of invasion assay for PC3. “*” Means significantly different from control group, P<0.05. Abbreviation: SPB, sodium phenylbutyrate. Tubastatin A is a potent and selective HDAC6 inhibitor with IC50 of 15 nM in a cell-free assay. It is selective against all the other isozymes (1000-fold) except HDAC8 (57-fold). TMP269 is a potent, selective class IIa HDAC inhibitor with IC50 of 157 nM, 97 nM, 43 nM and 23 nM for HDAC4, HDAC5, HDAC7 and HDAC9, respectively. Santacruzamate A (CAY10683) is a potent and selective HDAC inhibitor with IC50 of 119 pM for HDAC2, >3600-fold selectivity over other HDACs. TMP195 is a selective, first-in-class, class IIa HDAC inhibitor with IC50 of 300 nM in cell-based class IIa HDAC assays. Valproic acid is a fatty acid with anticonvulsant properties used in the treatment of epilepsy. It is also a histone deacetylase inhibitor and is under investigation for treatment of HIV and various cancers. Tasquinimod is an orally active antiangiogenic agent by allosterically inhibiting HDAC4 signalling. Phase 3. Western blot images suggested inhibition of HDAC4 increased the expression of NOX4 and MMP-9, and treatment with 10 μM SCM-198 reduced the raised levels of NOX4 and MMP-9. BRD73954 is a potent and selective HDAC inhibitor with IC50 of 36 nM and 120 nM for HDAC6 and HDAC8, respectively. Citarinostat (ACY-241) is an orally available selective HDAC6 inhibitor with IC50 of 2.6 nM and 46 nM for HDAC6 and HDAC3, respectively. It has 13 to 18-fold selectivity towards HDAC6 in comparison to HDAC1-3. Splitomicin is a selective NAD(+)-dependent histone deacetylase Sir2p inhibitor with IC50 of 60 μM, showing a higher activity in a cell-based assay. HPOB is a potent, selective HDAC6 inhibitor with IC50 of 56 nM, >30-fold selectivity over other HDACs. Effects of HPOB on GCs-induced apoptosis in PC12 and SH-SY5Y cells. (A) Effect of 48 h treatment with HPOB alone and (B) anti-apoptotic effect of HPOB pre-treatment for 24 h on Cort-induced apoptosis in PC12 cells. The results are expressed as the means ± SD of three independent experiments. ## indicates a significant difference from the control (P < 0.01). * indicates a significant difference from treatment with Cort alone at P < 0.05. ** indicates a significant difference from treatment with Cort alone at P < 0.01. LMK-235 is a selective inhibitor of HDAC4 and HDAC5 with IC50 of 11.9 nM and 4.2 nM, respectively. Cells were exposed to HDAC Class II selective inhibitors LMK-235 or Nexturastat A (NA) at the indicated concentrations for 48 hrs and analyzed by Western blotting. Rom, romidepsin; Bel, belinostat, Pano, panobinostat; SAHA, suberoylanilide hydroxamic acid. Nexturastat A is a potent and selective HDAC6 inhibitor with IC50 of 5 nM, >190-fold selectivity over other HDACs. Chidamide is a low nanomolar inhibitor of HDAC1, 2, 3, and 10, the HDAC isotypes well documented to be associated with the malignant phenotype with IC50 values of 95, 160, 67, 78 nM for HDAC1, 2, 3, 10 respectively. WT161 is a potent, selective, and bioavailable HDAC6 inhibitor with IC50 values of 0.4 nM, 8.35 nM and 15.4 nM for HDAC6, HDAC1 and HDAC2, respectively; shown to have >100-fold selectivity over other HDACs. CAY10603 is a potent and selective HDAC6 inhibitor with IC50 of 2 pM, >200-fold selectivity over other HDACs. U87 and U251 cells were treated with HDAC6 selective inhibitors and the cells were harvested for subsequent western blot analysis. ACY-738 inhibits HDAC6 with low nanomolar potency (IC50=1.7 nM) and a selectivity of 60- to 1500-fold over class I HDACs. 4SC-202 is a selective class I HDAC inhibitor with IC50 of 1.20 μM, 1.12 μM, and 0.57 μM for HDAC1, HDAC2, and HDAC3, respectively. Also displays inhibitory activity against Lysine specific demethylase 1 (LSD1). Phase 1. BG45 is a class I HDAC inhibitor with IC50 of 289 nM, 2.0 µM, 2.2 µM and >20 µM for HDAC3, HDAC1, HDAC2, and HDAC6 in cell-free assays, respectively. ITSA-1 (ITSA1) is an HDAC activator via TSA suppression, but shows no activity towards other HDAC inhibitors.